I have combination-oily skin. While there are tons of explanation for this skintype, what I mean by the term "combination-oily" is in summers and if I am out a lot, my skin tends to get very oily and is prone to getting acne attacks quite easily. On the other hand, if I am just staying at home and/or it's winters and/or if I stay in a non-humid place, then my skin can dry patches, especially around my mouth. Now, this might also be a sign that my skin needs some internal rehydration, but it also means that I prefer cleansers that can do an effective cleaning without drying out my skin. 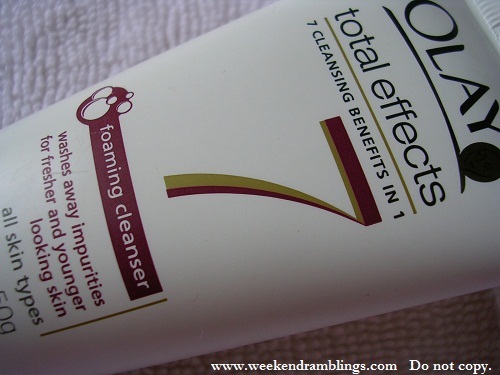 An excellent example of this kind of cleanser is the Olay Total Effects Foaming Cleanser that I picked up in India (have not seen it in the US). I wanted a more affordable alternative to the Shiseido cleanser I had sampled (here), and this seemed a good enough match (good enough to me, that is). The packaging is a tube with a flip-open cap - convenient to use but do pack separately while traveling or carrying around in the bag to avoid accidental opening and/or spillage. The cleanser is a white, mousee-type cleanser. It's quite gentle and does not dry my skin out, yet it does a good job of getting all the bad dirt out. Clean without being dry at all. Though marketed for those looking for antiaging, I feel this is perfect for just about anyone. Not for the superoily-skinned person, maybe, but for normal and/or combination skin this seems perfect. Ingredients: Water, glycerin, myristic acid, stearic acid, palmitic acid, sodium lauroyl sarcosinate, potassium hydroxide, lauric acid, polyquartenium-10, DMDM hydantoin, fragrance, tetrasodium etidronate, pentasodium pentetate, iodopropynyl butylcarbanate, niacinamide. i love this one and reviewed it too sometime back..excellent one na? I have not liked anything of olay till now!! :( ..Olay white A bigggggggg disappointment. I am using olay total effects and it makes my skin so oily!! 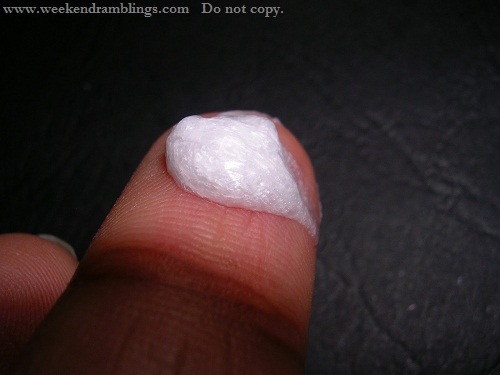 :( :( :(...Same experience with Neutrogena products too..grrrrrrrr!! hi rads..looks gud thgh havent tried ne of OLAY prods.. 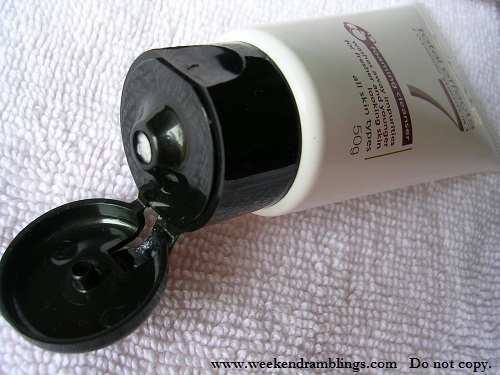 I used this cleanser for abt 10 days & it broke me out!! Also it left my skin feeling taut & stretchy. It looks like those vanishing creams like fair & lovely, which hv that pearly shine. I told d SA it wont suit me & thats what happened.